reshens the air without any artificial chemicals, Destroys odors - Does not just mask them, Made from the highest quality biodegradable citrus ingredients, Non-aerosol container carries no fluorocarbons, hydrocarbons or propellants, Unique spray system delivers a finer mist than most products to spread and circulate more efficiently, Works faster and lasts longer than perfumed chemical air fresheners. Love this air spray! It smells delicious and not overpowering at all! A little goes along way and the can lasts forever! Most scented products bother me but this product doesnâ€™t! I hope Well never stops carrying it! How come I could only find this marvellous and perfect air freshener online at well.ca? Seriously, I tried every smell and it's like nothing I've ever used before. The bottle lasts a LONG time, the fragrances are strong and very natural. With the help of a tiny spritz, literally, I've cleaned up the air of all nasty smells I've encountered; cigarettes, garbages, oil, fish, cooking, etc. The smell is never overwhelming. I don't understand that this is not more known and popular. The price is really reasonable. I also love the POO POURRI sprays, but it's expensive compared to this spray and I find the fragrances to be a bit overwhelming at times. 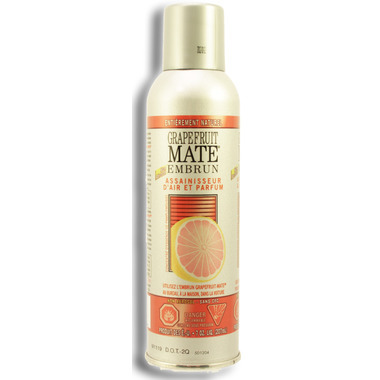 I guess that because this spray, Orange MATE has a really fine mist, it's more effective at dispersing everywhere in the room. Anyways, don't hesitate and purchase, I really doubt you'll be disappointed, take it from someone who's been looking for good air cleaners everywhere!!!! I find this to be too sweet for my taste but others might enjoy it.